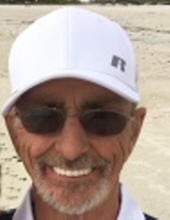 Barry Craig Smith, age 63, passed away, Saturday, November 24, 2018, in Sebring, Florida. He was born October 29, 1955 in Georgetown, Kentucky to Leighton Craig Smith and the late Marilyn Sue Ellis. He was a truck driver for 33 years. Barry was avid at woodworking and studying history and he enjoyed boating, fishing and golfing. In addition to his father he is survived by his 5 grandchildren, his brother, Gary Smith, his sister Jody Gaines, his special Aunt Betty (Donnie) Green and Aunt Janie (Jimmy) Lewis, all of Georgetown. Barry is also survived by his brother, Eddie Hunter. He was preceded in death by his son Allen Craig Smith. Memorial Visitation will be Wednesday, December 12, 2018 at Tucker, Yocum, & Wilson Funeral Home starting at 12:00pm until time of the Memorial service at 1:00pm. To send flowers or a remembrance gift to the family of Barry Craig Smith, please visit our Tribute Store. "Email Address" would like to share the life celebration of Barry Craig Smith. Click on the "link" to go to share a favorite memory or leave a condolence message for the family.